Frozen strawberries are convenient to have on hand throughout the year for smoothies, alcoholic beverages, strawberry sauce, desserts, etc. So I stock up on fresh strawberries in the summer and freeze them for the fall and winter. I recently found a bag of strawberries at the bottom of my deep freezer from two years ago. To my surprise, when I defrosted them, they still looked and tasted great! So I thought I’d share my method for freezing strawberries. It’s tedious and time consuming, but well worth it, in my opinion. Photo below: Strawberries defrosting. After spending 2 years in the deep freezer, they were still great. 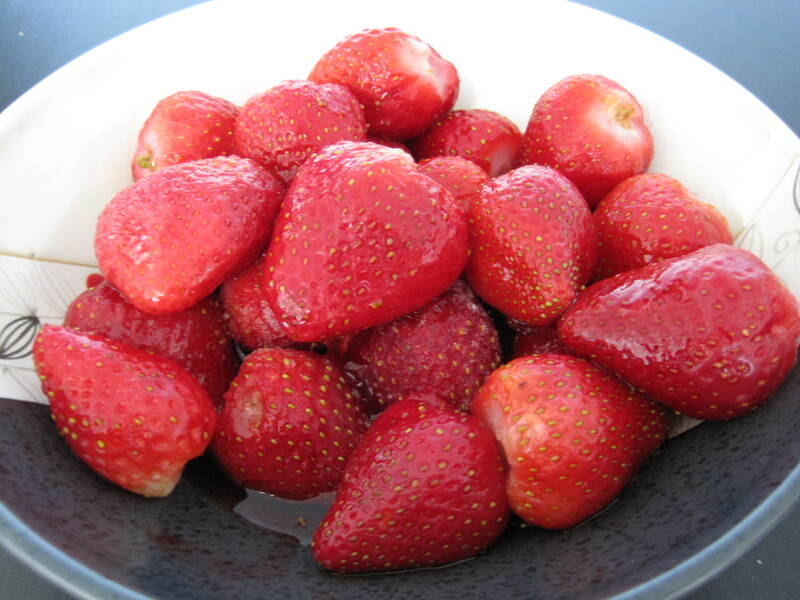 Use good quality, ripe strawberries. Step 1: Wash the strawberries in cool water. Leave the hulls on or else the strawberries will absorb excess water. Step 2: Allow the strawberries to dry off completely. Step 3: Remove the hulls with a sharp knife. Step 4: Spread the strawberries out on a baking sheet in a single layer and place in the freezer until just frozen through. Step 5: Place the strawberries into a large freezer bag, squeeze out as much air as possible and seal the bag tightly. Then return to the freezer until ready for use.